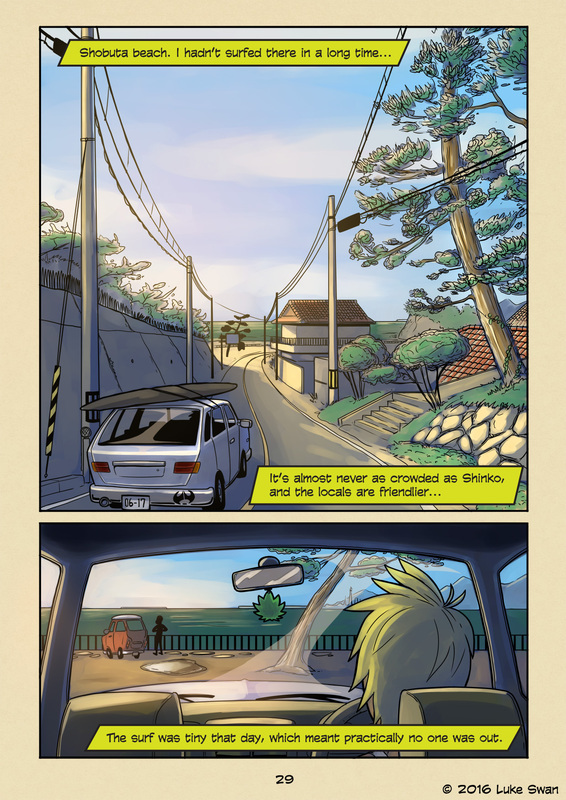 Shobuta Beach (#029) | Web comic "Surfer Joe"
Well, technically my first wave was in Maui when I was 18. A surf instructor pushed me into an ankle high roller. All I had to do was stand up. It felt so easy. Floating above the water looking down at the coral below is a memory that will forever be etched in my mind. But the first wave I caught on my own and stood up on was at Shobuta. I was 30. My friend Shin took me and let me use his funboard. I remember the waves being knee high with a decent amount of wind chop. Shin didn’t seem too interested in the waves, but he was a surfer, and most surfers probably wouldn’t have paddled out that day. I wasn’t a surfer yet though. But I remember being absolutely determined to ride a wave. By the end of the day I was catching them pretty frequently, but getting to my feet was proving difficult. I was running out of time, and I recall telling myself that I wasn’t getting out of the water until I stood up on a wave. I must have ate it 20 times, maybe more. But I finally got it. I stood up. It was touch and go, I was shaky all the way up to my feet. The first time since I was 18 years old I got that walking on water feeling, even though it was only for 2 seconds tops. From there I was hooked. I bought a big yellow foamie off the internet the next day.